*The soles have some dirt from use. *There is still plenty of tread on the soles. Every now and then, the countless scree fields, muddy ravines, and rooty high knees try their darndest to get the best of you?? 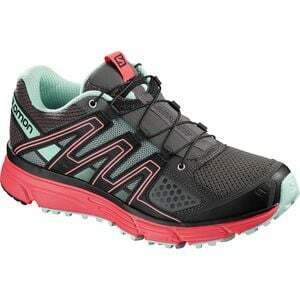 ?so fight back with the Salomon Women's X-Mission 3 Trail Running Shoe. Built to crush the inclines and ensure steady footing on the descent, this reimagined trail runner features a newly renovated high abrasion and wet traction Contragrip sole which utilizes strategically placed lugs and high density tread, which ultimately encourages paramount stability and grip when you need it the most. The breathable open mesh, durable Quicklace drawcord system, and SensiFIT system provides a comfortable, locked down fit but without the frequent friction hot spots and unsavory blisters. Not to mention, the X-Mission 3 is equipped with neutral support, SensiFlex, asymmetrical heel counter, and EVA injected midsole which cater to a smooth and comfortable ride. X-Mission 3 Trail Running Shoe - Women's Magnet/Black/Poppy Red, US 8.